Twelve years of NKT attacks against the Dalai Lama, while portraying ugliness that has dissuaded many away from Buddhism, have failed to derail the Dalai Lama's message of compassion. NKT's recurring prediction on behalf of its main deity, Shugden, that "One day, he will fall like Humpty Dumpty!" has proven to be shortsighted. The Dalai Lama continues to teach and practice compassion, as do all genuine Buddhists (not NKT), Dharma protectors, Bodhisattvas and Buddhas. The Dalai Lama and the state of Washington's Governor Christine Gregoire, left, take the stage as katas (ceremonial scarves) and a Tibetan flag are waved in the background. NKT portrays the Dalai Lama as evil, a liar, a non Buddhist and a fake Dalai Lama determined to destroy Buddhism. NKT portrays Tibetans and the hundreds of millions of us who respect the Dalai Lama and his life of compassion as co-conspirators. NKT portrays itself as the purest savior of Buddhism as it nonsensically wars with the Dalai Lama, an incarnnation of Avalokiteshvara (Bodhisattva of Compassion), over an imaginary threat to its 'religious freedom'. "When the Dalai Lama spoke of compassion Saturday at Qwest Field, he talked in grand terms: about his concern for all 6 billion people on Earth, about fostering peace between world leaders. When 7-year-old Isobel Williamson, of Seattle, spoke of compassion, she talked about being nice to people with skinned knees. On the Dalai Lama's second of five days of public appearances in Seattle, the emphasis was on putting compassion into actions — large or small. And from the Tibetan Buddhist leader's speech, to the dozens of organizations in a resource fair, to the people who attended, there were many examples of the varying forms such action could take. William Bell, president and CEO of Casey Family Programs, took to the stage. "What will you do with your compassion?" he asked the 50,817 in attendance. "Will you keep it buried in yourself? Or will you release that power through your actions?" Gov. Christine Gregoire said she wanted "our government to be compassionate" but it is the acts of individuals that help ensure children live happier lives. Then the Dalai Lama was introduced, to a standing ovation. He urged people to use nonviolent dialogue to resolve problems — whether at the family, community, national or global level, saying the 21st century should be the "century of dialogue." Nonviolence is not just the absence of violence, he said, but facing problems with determination, vision and a wider perspective, while "deliberately resisting using force." But people also need "inner disarmament" — to not let emotions like suspicion and fear take control. To achieve that, simply praying or meditating isn't enough, he said. Compassion has to be promoted. The Dalai Lama reiterated some of the points he made during public appearances Friday, including his belief that compassion has a biological component, and his call for compassion to extend to not just one's friends but also one's enemies. "Everyone has right to overcome suffering." "Six billion human beings are ultimate source of my happiness," he said, so it's in his interest to be concerned about all of them. He said world leaders might be able to act more compassionately by gathering, along with their families, for a week or two with no politics, no business, no agenda. Their children should play together. Once they know each other as human beings, "then maybe when some serious differences come, they can try to form some effort." Jim Woolley, 37, who works at a grocery store in Seattle, is already acting on an individual level. In the past year, he's tried to intentionally focus on compassion, openness and honesty. Throughout his day, in various situations, he stops and asks himself if he's acting according to those ideals. Hilary Wogau, 52, a psychotherapist from Vashon Island, came with her partner and 9-year-old son. They try to make compassionate acts a part of their life by, for instance, donating vegetables they've grown to local food banks. And they'll go home, she said, to figure out more needs in their island community that they can respond to. She thinks the time is right for the compassion message. "I think with the economy the way it is and all the things happening in the world, I think people want to have hope. They want to do things differently. ... I think the Dalai Lama inspires people. And I think people are willing to hear it." Sure, any lasting change would require much more broader, sustained action than a five-day event, Wogau acknowledged. "But if you don't inspire, you won't have action." The situation in Tibet, though not the focus of the day, was acknowledged briefly by speaker Lama Tenzin Dhonden, the Dalai Lama's personal emissary for peace and a co-founder of Seeds of Compassion, which is organizing the gathering. The Dalai Lama and other exiled Tibetans had to create their lives again in India after fleeing Tibet in 1959, Dhonden said. "He had to create everything to keep his people alive — physically, mentally and spiritually. And he has succeeded." The danger in Tibet now is "clear and it's growing, as you have seen recently," Dhonden said. Autonomy would be good for Tibet and also good for China, but that would require China to engage in serious dialogue, he said." 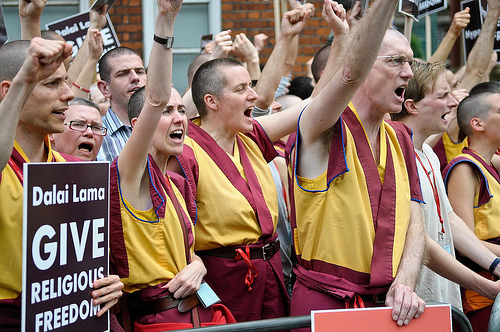 Amazingly, Kelsang Gyatso and his followers refuse to open their hearts. 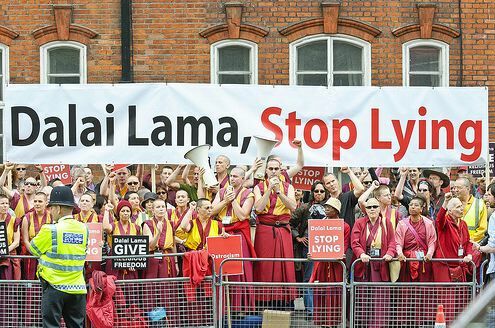 They prefer to ridicule the 50,817 at this event, like all the hundreds of thousands of those who attend the Dalai Lama's teachings every year, as deluded and wasting their lives in listening to messages of compassion. They also prefer to protest against the Dalai Lama along side the communist Chinese government to sybiotically undermine the Dalai Lama. This week Farrah Fawcett died from her private war with cancer. Watching her home-movie diary, Farrah's Story, I could not help but be reminded how irrelevant, futile, counterproductive and shameful that NKT's war with Buddhism is. Fortunately, the question 'who are these people' can be readily answered with the large quantities of available analysis of NKT, history regarding the harmful purpose of its deity Shugden, and evidence spewed directly by NKT's own protest rallies and Internet attacks. 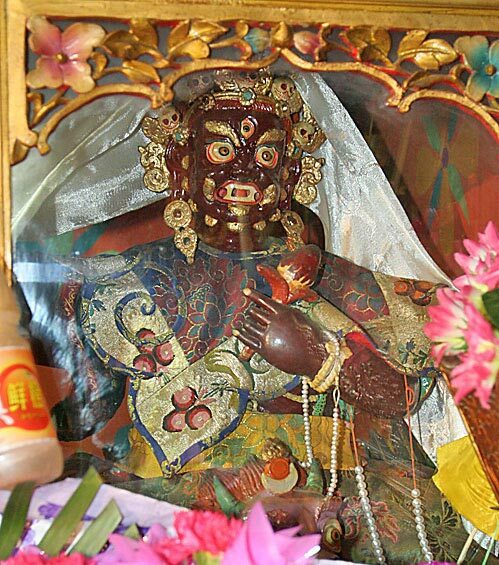 For NKT, its need to protect Shugden outweighs its desire to practice Buddhism.